. : Optics & Photonics Focus :: A New Instrument for the Laser Orchestra :. Pipes Unclogged The Quantum Physics Way! Quantum effects are often portrayed as far more fragile than classical ones. However, classical physics sometimes lets us down when it comes to errorless transfer of data; when this is the case, quantum physics could come to the rescue! Quantum cryptography promises inherently secure communications… in theory! But what actually happens in practice? Recent studies show how weaknesses in a real system can be exploited to perform an “undetectable” quantum hack. Laser physics and music share surprising analogies: lasers and flutes, for example, have been tuned in a very similar way until now. Recent experiments show that lasers can also be tuned in a way that does not find a counterpart in music, well not yet at least. A terahertz tunable laser. In this artistic representation, the laser is the yellow wire, which is mounted on the grey support block. The electromagnetic field inside the laser reaches beyond the transversal dimensions of the wire, which makes it possible to influence the lasing frequency by moving objects close to the wire. Vent instruments, such as flutes, are played by modifying the effective length of a tube. Analogously, lasers are typically tuned by varying the effective length of the laser cavity. Could a laser — or a flute — be tuned by dynamically varying the diameter of the tube instead? 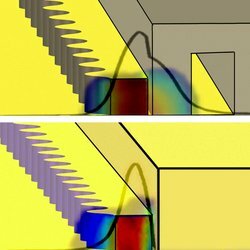 Qing Hu's group at the Massachusetts Institute of Technology (MIT, Massachusetts, USA), in collaboration with John L. Reno from Sandia National Laboratories (New Mexico, USA), has developed a new way to do just that: they tuned a terahertz (THz) wire-laser by modifying the effective diameter of the cavity. Flutes are amongst the simplest and oldest musical instruments. Their sound results from the flow of air across a tube, a resonator. The pitch of the sound can be varied by opening or closing of a few holes, thereby varying the effective tube length. This is a beautifully simple musical principle. As a result, flutes have been ever present throughout the history of civilization and have been made of a huge variety of materials ranging from bones to clay, wood to metal. Just like flutes, standard lasers also consist of a resonant device: the optical cavity. Put simply, an optical cavity is created by placing an amplifying material between a pair of mirrors. The light passing through the amplifying material gets intensified and the mirrors keep it bouncing back and forth inside the cavity. In this process, most wavelengths are suppressed through destructive interference inside the cavity. Only the wavelengths that are proportional to the cavity length survive and are lased. In close analogy to a flute requiring a stream of air to create tones, a laser needs light to enter and leave the cavity. The activation of the amplifying material can be thought of as the influx of air in a flute. For the laser light to exit the cavity, one of the two mirrors is taken to be slightly transparent. Hu's idea was to use an unusual approach for tuning a laser. "Our starting point," Hu says, "was to see if we could tune a laser by modifying the surroundings, the outside, of the cavity. In terms of flutes, this is similar to continuously varying the diameter of the flute's tube." For their approach, the MIT group used a device with tiny transversal dimension and a comparably large length, similar to a straight piece of wire. The thickness of their device was significantly smaller than the laser wavelength. Therefore, large parts of the electromagnetic modes resided outside the wire, offering the possibility to manipulate these modes by placing different materials right outside the wire. In their experiment, Hu's group moved either a silicon (for red-shift tuning) or a metallic (blue-shift tuning) plunger next to the wire. By doing so, they were able to tune their device lasing at approximately 3.85 THz over a large range of 137 GHz in both red-shift and blue-shift directions. How to tune a wire laser. Since the width of the wire laser is far smaller than the lasing wavelength, a large fraction of the electromagnetic mode resides outside the gain medium (cavity). The resonant frequency can therefore be manipulated by placing movable objects close to the wire. The illustrations show the effect using a silicon plunger (top) and a metallic plunger (bottom). Apart from the intuitive beauty of Hu's approach, one should not forget that generating a terahertz laser has long been a nearly impossible task. 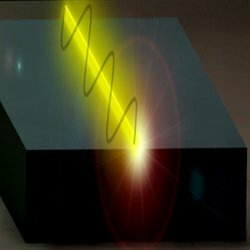 The frequency range of 1 to 10 THz (wavelengths of 300-30 micrometers) was not available for lasers using traditional techniques, giving rise to the notion of the "terahertz gap" and is still a rather complex new field of research. On the one hand, conventional solid state photonic devices are able to generate radiation frequencies at approximately 10THz or higher while electronic devices can reach up to approximately 1 THz. On the other hand, at the present state of this art, lasers creating THz radiation — the recently developed quantum cascade lasers — require complex setups and typically involve extensive cooling. Similarly, the wire-laser also needs a cryostat and vacuum and is not yet as easy to use as an everyday laser-diode. Filling the THz frequency gap creates new possibilities, new technological approaches and even new applications: just like colored materials reflect some wavelengths while absorbing others, terahertz radiation can penetrate some materials that are opaque at visible wavelengths. Therefore, terahertz lasers are getting a lot of attention in connection with security applications, such as passenger scans in airports: terahertz radiation can penetrate materials such as clothes that are opaque at visible frequencies. "The problem," Hu explains, "with this application is the low spatial resolution we achieve with this approach. A more immediate application is therefore the use of terahertz lasers for identifying chemicals using what is called a spectral fingerprint." In this approach, absorption and emission spectra of terahertz radiation is used to identify solid and gaseous chemicals. Similar to Raman spectroscopy, the absorption and/or emission spectra are then compared to a database to identify the substance in question. "The holy grail of THz lasers," Hu explains, "is creating a device that can be used at room temperature, no more complicated to operate than a laser-pointer." Of course, there is still a very long way to go until THz lasers approach that stage. At present, Hu considers his research closer to applied science than to direct commercial applications. "The beauty of this approach," Hu concludes, "is to see the connection between lasers and musical instruments — and to see how we can play with concepts of generating sound or light waves." Qi Qin, Benjamin S. Williams, Sushil Kumar, John L. Reno & Qing Hu, Tuning a terahertz wire laser, Nature Photonics (2009) 3, 732 - 737 (link).